I am getting really keen now to finish the work for my show so I can move on and try new things. Is that a bad thing? I feel I aught to be more caught up in what I am doing but I've got two ideas I really want to work on and right now that feels the most important thing creatively. Fortunately my head does have control and I will finish my cows. I wish I could remember who's blog started off this need to do something different. I read something somewhere about Chuck Close. I hadn't heard the name but I recognised the work when I checked the site. It's interesting, but not quite to my tastes. However I can see ways the ideas nearly meet what I do, and I want to explore that area. I think it could be fun even if it isn't successful. Well I will be able to hang my work. The extra stands I need have just arrived. It may not sound like a big deal, but it was worrying me. 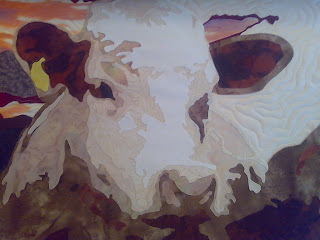 In fact I was sitting here cutting pieces of cow trying to work out a plan to hang quilts if the stands didn't appear. Now I can concentrate much better on my work. It's odd but these small things are taking quite an amazing amount of my time and energy. Still next time I will have all these things so it should be easier right? I have been trying to keep quiet about what I am working on to make to show as fresh as I can, but it makes blogging very hard. Today I can't resist, and this is a very small part of the whole quilt. I have spent about five hours working on this. For a lot of the time it really didn't look like much. Suddenly it came together and I have a cow. Well my metre long 'manageable' pieces have finally come together and made a sky. I know that doesn't sound terribly impressive, but I am pleased with it. I think it is about a third of the quilt finished. It's quilted and everything. So tomorrow I can get on with what I think is the interesting bit. Of course being rather large this is another piece I won't get to see until it is pretty much finished. Really the first good look I will get will be when I hang the show. I hope the picture in my head is right. Yes it is a bit nerve wracking, but I just don't have anywhere I can hang it to check while I work. I just have to go with blind faith right now. 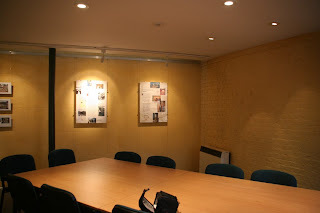 I wonder if having a large design wall would change how I work, and if it did would it change my work? I realised today my show has taken on a\life of it's own. Well actually it's stolen mine, I just hope it gives it back at some point. It is, I suppose, a positive thing. The fact that I am getting so many contacts about it suggests that word is getting about, and I am thrilled by that. On the other hand every day I seem to find more things I have to do for it, and I really feel like I am running out of time now. I don't need more jobs to do. On the other hand I was very pleased to be contacted by a local paper (see press releases can work) and I wouldn't have changed it for the world. It would have been nice if someone else could have done the photo shoot while I got on with some work :) I have learned a lot already from this experience, and I suspect I have more to come. Back in October I wrote Planning a Show a collection of advice I was given to help get a show together. It's certainly proved to be good advice. I have a few extra points to note. Press Releases - these are harder to write that I had imagined. I needed a lot of help with mine. So find someone to bounce ideas off and give a different point of view. Don't plan a show with less than 6 months lead time. Really, it's not long enough. OK I suspect no length of time is really long enough, but many publications want your show dates 6 months in advance, so they will not print your event if it is sooner. That can mean loosing a lot of potential publicity. Also people need to hear about an event several times before it really sinks in that they want to go, and that takes time. Publicity - around here the optimum time to contact people seems to be about a month before the event. So all printing needs to be done before then. That in turn means the design and planning must all be done before then. Get help. Any help anytime. I am now realising that if I had asked for more help with things like addressing envelopes and finding addresses I wouldn't be feeling so fried now. At the time I was happy to do the work myself now I suspect I would be better off if I hadn't. Order your guest book sooner rather than later. I assumed that getting a guest book would be easy. It turned out to be harder than I expected at a time when I really didn't need the extra stress. Write down every piece of advice, every lead and every contact. Try and make the notes clear enough that other people can understand them too. I have been amazed by the support and leads I have been given. I haven't managed to follow them all up, but I have them all written down and I will use them next time if not this one. Keep reminding people about all dates your show is open, and encourage people to come on different days. Look for and record all the positive things you get from the show, even those that come up before the show. Try to take time off to relax. I have to admit I am not quite managing to follow all the advice. I have several people I would like to get in touch with before my opening, but I think I am just going to have to accept I can't do everything. I have however finally got the details of the Monday events up on my website. On the exciting and low stress side, I got the proofs of my giclee prints. They are much more effective that I had expected. I wasn't sure about prints of textiles, but it does seem to work. I am really pleased that this at least seems to be going roughly to plan. You must have noticed the number of boring tasks you can get done when there is something you are trying to avoid. I've just cleaned my iron, not the sole plate, the top. Now, OK, it wasn't entirely a distraction tactic but it isn't the sort on thing I would normally do. I need to take a photograph of me doing some pressing so I thought it would be better to have a cleaner iron. In turn it made me wonder. Do people writing books buy all new equipment for the photographs? How often do you see pictures of equipment that looks well used in quilt books. That click tells me my iron it up to temperature and I have pictures to take. Which also means I have to get back the the writing. Yes class this is how late I leave these things, see you in the morning. 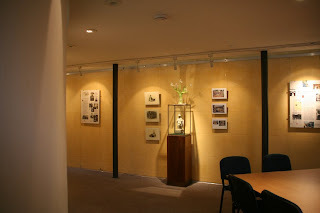 Here are some pictures of the Dissenters Gallery where I will be having my show. I took these a couple of weeks ago to allow me to plan where I will hang things. It suddenly occured to me you might like to see the space too. 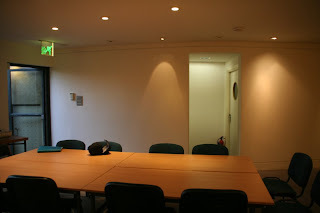 The Dissenters Gallery is attatched to the Dissenters Chapel which is at one end of Kensal Green Cemetary. It has it's own entrance, as well as being accessed from the cemetary itself, but if you are there during the day it is lovely to walk through the cemetary from the main entrance. To the left of the first picture you can see entrance, which is next to a huge window, essentially that whole wall is glass. It faces a long flat wall where I am planning on hanging some of my longer and less flexible pieces. I quite like the fact that the longest wall is broken up into sections by vertical pillars. It sort of adds an extra frame to the work. You can see a doorway in the curved wall next to the entrance. I am hoping I can hang a small piece on the wall inside it. It's a funny little alcove but again it nicely frames whaever is hung there. I've got a couple of ideas, but you will have to wait for the opening to see if I actually manage to do it all. That will be the trickiest place to hang anything as there isn't a picture rail there, but I think I aught to be able to come up with a cunning solution. 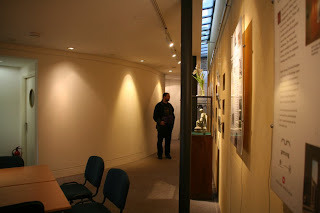 As you follow the curved wall arround the gallery narrows to almost a corridor. If you look at the third picture you can see there are skylights all the way down it. I am hoping that having light coming in from above will really show up the quilting well. In the evening the rows of lights should produce a similar, yet different effect. 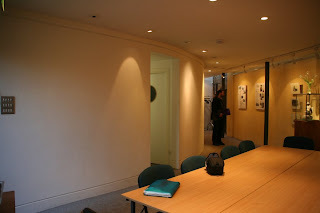 The tables in the middle of the room won't be there for the show, but depending on how many people sign up for the classes we may set them up and work in the gallery. It's nice to have the option. Finally this is the view from the door. The wall directly ahead is flat, but the brick wall to the right is another curved wall. Depending on your perspective this gallery is somewhere between challenging and quirky. I am enjoying working out ways to hang large pieces on curved walls. Apparently most people just put small things on them, but I don't really do small so I have to come up with other ways to deal with the walls. Regular readers will remember that I have issues with a lot of terms of service I find on the web. Every so often I wonder if it is just me. No one else seems to have the problems I have finding web sites they are happy to use. Well today this site was brought to my attention. It isn't just me! Now Michelle, the author, says she will probably sign up for the service anyway but be very careful about what she is giving away, a fine informed choice, but I still worry about the number of people who don't read these agreement, or dont understand them if they do. I've been trying to get a photo book printed. This is a service I will be paying for. Yet the companies are still demanding some rights to my work. I assume that as they are still in business, most people are happy to give these rights away, but why should I let a company I am employing use my work for free to advertise itself? Actually I could see me doing exactly that, if I was asked personally, but as the terms of business? I don't think so. The print on demad book industry also has some interesting ideas on what rights they should have. Several insist you must let them sell your book, but more concerning are those who have rights to publish illustrations and extracts from your work for free in perpetuity. OK maybe you won't ever make it big, but if you do you will really regret these agreements. Personally I don't really want other people being able to publish extracts of my books for free whenever they feel like it. One also has the right to use and rewrite as much of your material as they feel like and republish without crediting the original author. Again, these places are still in business so I have to assume a lot of people are accepting these terms, but do they realise what they have done? Please guys, if you are using any service read the terms and conditions. The small print it is binding in most cases. So I've started putting this monster quilt together and I've discovered that my massive amount of fabric isn't enough. Specifically the wonderful end of the world sky fabric just isn't going to stretch. So I can't do any more on it until Sunday at the earliest. How annoying is that? I would like to say just as I was getting to grips with it, but really that wouldn't be true. The 'nice manageable' bit I started with barely fit across the width of the fabric. Still I can say it is coming together and I think I have the first third under control. I guess tomorrow will be spent working on the next chapter of my book. Probably just as well given I will be teaching it next Wednesday and I think I have something booked every day between now and then. People often ask if anything daunts me, and it has to be said very little does. However I have come up with something that is giving me more than a moments thought. It isn't difficults, but huge and I don't have a studio big enough to fit it in sensibly. I've spent the last two days just trying to work out the logistics of handling this piece. I am really looking forward to getting on with it. I think the only place I can lay out the background is the longarm fram. Of course it is only really going to work on the skinnier elements, but that will be a help. It would also mean I could stitch the pieces into place as I go so I won't have to worry about them moving before I finish. Did I mention this thing is big :) Yup count me somewhat daunted, but very excited. Poop still no spell checker. Oh well you'll just have to forgive the spelling, sorry. Oh on the exciting note. My images have just gone off to the giclee printer. 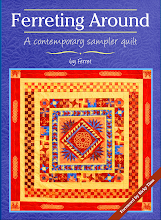 I can't quite believe I am getting my quilts reproduced. In a couple of days I should get some proofs, how wierd is that going to be. Thanks to all those who have got in touch and sent me their addresses for show invites. If there is anyone from Veritas reading I would love to invite you guys but I don't have any contact details so please do get in touch. Things to consider at the design stage. I am sitting in a laundrette watching a washing machine, there are many more fun things I could be doing had I been more careful when I designed my quiilt. I have two quilts that I can't wash at home so they don't get used as much as I would like. The first was a very early quilt, before I had seen one other than my own so it has vey fat polyester wadding in it. I had assumed that as king size duvets fitted in my machine it would. I was nearly right, but closing the door on my (front loading) machine really is essential before washing so nearly won't do. Still a mistake like that I can live with. We all have to learn sometime and while we are we can't expect everything to go smoothly. The other troublesome quilt is rather more embarassing, I should have known better. I have a very large bed and I was bought enough fabric to make a quilt to really cover it. I came up with a design and checked it would fit on my (at the time new) longarm. It did, just. I thought as I was going to be putting a lot of quilting patterns on it it would be nice if they showed up well, and as I needed a winter quilt I would use two cotton waddings in it. Now this is the point I could have saved myself a lot of trouble. I had the top, and the back and the waddings. If I had just checked they fitted in the machine I would have only used one wadding and had a much more useable quilt. I do love 'Ginko Typography' but I wish I didn't have to spend an hour watching it wash. Thank you for your concern, I'm fine and I have reasonable internet access, I'm just lacking time. I knew organizing a show was going to take a lot of time and effort. I just hand't worked out quite how much. It seems to take foever just putting things into envelopes let alone finding addresses and answering email. Don't get me wrong I am enjoying it a lot and I am thrilled at the requests for information, but they do all take up time. I have also been quilting like crazy, both my own work and customer quilts. It felt great spending two full days with the longarm after far too long at the computer. It's odd, when I don't do it for a while I find it very hard to get restarted but when I do I don't want to stop. So if you don't hear much from me for a while you can guess what I am doing. I will be taking one item off my list and adding several more. If you are in the UK and haven't had an invite to the private viewing get in touch and I will get one to you. I've discovered I know where a lot of people live but I don't have their addresses. Please excuse my spelling the spell checker doesn't seem to be doing anything. Hi to everyone from the University of Kent who has been visiting recently. I guess I should explain a bit about why my exhibition posters have appeared on your notice boards. I studied Physics with Astrophysics there some (cough) years ago. Even though it has been quite a while I still feel very close to Darwin college, and I couldn't resist inviting you all to see my show. I can't leave all the art to the students at the art college in town now can I. Also I think it would amuse some of the lecturers there how far from science I have strayed. Although strangely quilting seems to attract quite a lot of science based people. I guess it is realy and engineering subject where maths is very useful. If you are going to sculpt in textiles you really do want a grounding in some kind of structural engineering too. I've been really thrilled with how many of you have taken the time to look at my site, but I suspect it won't have been entirely to your tastes. Still if you do feel like coming and seeing my work it would be great to find out what is going on on campus now. 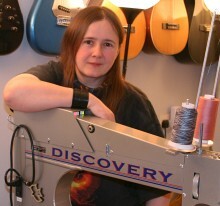 I am also trying to encourage people to do more interesting things with textiles. There is a lot of scope, and very few people seem to be trying to exploit it. There are many ways of incorporating electronics, computing and robotics into textiles, and I don't have time to explore all these avenues myself. It's time textiles broke out of their rather old fashioned image and did something more exciting, ideas and collaborations invited. How do you write about a writer? I've been postponing this out of sheer cowardice. I have a friend who writes, well. Professionally in fact and he has just had his first graphic novel published which is great. The problem is I know that as soon as I mention his name there is the risk of not only him but his friends reading my words, and they know what good writing is. Still I can't put it off any longer Cy is one of my oldest friends and it was great to get to see his work on a shelf in a real shop being sold (and signed) to people he didn't know. I think that is one of those signs of success, someone you've never met wanting you to sign something. This comic is based on Robert Heinlein's Starship Troopers. Those of you who have read my profile may remember that he is one of my favourite authors, in fact I would say I brought myself up on his stories, so there was plenty of scope for the comic to offend me. Cy however has been very aware of the feeling people have for the original work and has succeeded in producing stories that I feel complement the original. Nic (the other half of the CyNic team) had managed to arrange a secret launch party this Saturday, a feat not dissimilar to herding cats (without a laser pointer). With fans, friends and even a Starship Troopers cake (well done Manny) it was a fun and memorable event. It was held at Whatever Comics in Canterbury where we all went to university. This shop must have been supplying Cy with comics for about 20 years so it was the only place to properly celebrate his first publication, and it gave me a chance to finally get to know people I have heard a lot about over the years. Manny lived up to everything I had heard and astounded me with his enthusiasm for my work. He has actually caused me to revise my main site to include a links page, and has given me ideas for other improvements. We also discovered that there is a mail order service for comics and the shop will call you to tell you there are comics ready to send. For us this would be ideal as we are terrible at remembering when new issues have come out and need collection. This could be our way back into reading comics. While I was there I also visited the university. Boy it has changed. The physics lab isn't anymore and the whole campus felt abandoned. When I was there, there were always students about doing things now it seemed empty. Do all students go away at weekends now? Still I did have the chance to leave invites for Bob Egar who was the master of my college and who is stil working there in computing. Now I must love you and leave you, the Britsh Museum is calling me. Well done Cy, keep up the good work.